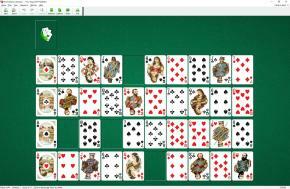 Four Ways Solitaire uses one stripped deck (36 cards). All cards are dealt face up in 4 rows of nine cards each (not overlapped). Aces are discarded, creating four gaps. To rearrange cards in the rows to get suit sequence (running from 6's to Kings) on each row. Aces at the left of the rows determine the starting suits of each row. Each gap can be filled with a card that makes a correct in-suit sequence with the card at the left of the gap. The gap at the extreme left of the row can be filled with a Six. The gap to the right of a King cannot be filled. You can fill gaps until all of them are blocked by Kings. Click on the empty stock pile to redeal. 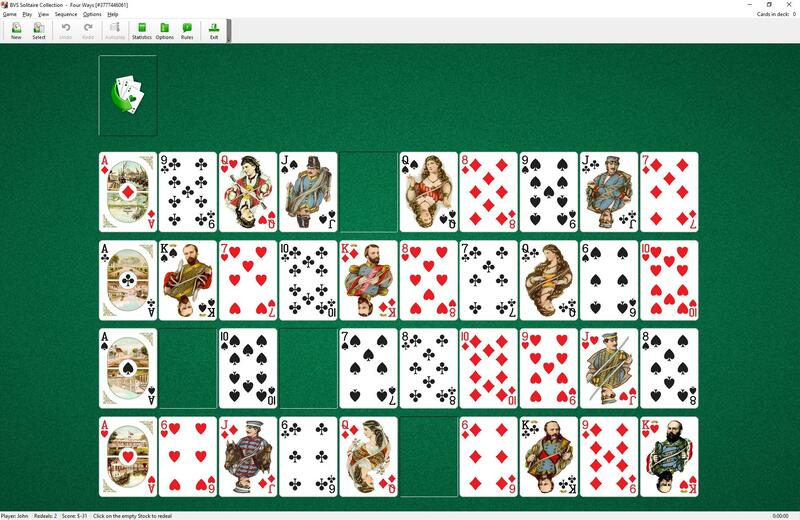 On a redeal, all cards that are not in a proper suit sequence beginning with a Six are gathered and randomly dealt back, leaving gaps just between the ends of suit sequences and the new cards dealt. Four Ways is an abridged version of Gaps Solitaire.